Looking at the star filled night sky we see various shapes, some of which resemble animals, others deities and others geometrical or abstract shapes. The first to observe these forms were the ancient Babylonians and later on the Greeks. Both great races, with minds full of curiosity and imagination, thus leading to the creation of various fables, related to these constellations. The fables reflect humans’ efforts to approach this distant and untouchable world though the use of their imagination. They believed that Gods lived there, along with the Titans and other supernatural beings which would sometimes fight among themselves. This interpretation gave them a sense of meaning and enhanced their interest in the star filled sky. To them, the universe resembled an imaginary television through which they viewed a plethora of intriguing films. Today, thanks to modern scientific advancements, such as satellites, we have revealed certain nebulae which are found in most constellations and constitute the hatchery of the stars. We now also have the ability to know the size, the splendor, the temperature and the constitution of these stars which ultimately compose the constellations. We can even know, precisely, how many millions or billions light years a star abstains from the earth, igniting within us a sense of awe towards the grandeur of the astronomical distances existent in the universe. However, nothing has been revealed to date, with regards to civilization and life that exists on these stars. Painting is a mean by which one’s imagination can be developed to see things that logic cannot see. Observing pebbles which I found in the birthplace of Aphrodite, goddess of love and beauty, I discovered they depicted landscapes which formed a microcosm (of their own). They reminded me of distant dream worlds from galaxies. They vary infinitely and are as infinite, unique, and as beautiful as stars. 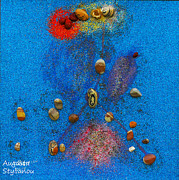 The idea then came to me to paint the constellations and to assimilate the pebbles with planets and with stars. In this way, one could be fooled to think that one can learn or approach even further these constellations and become acquainted with their distant and mysterious world. To transport oneself through the eyes of imagination in fantastic worlds and feel the greatness, the beauty, and the complexity of the creation of the universe. To bring oneself closer with the entireness and feel united with the creation and the universe.